Spring has sprung and we’re ‘hitting the town’ with the top things to do this weekend March 22-24! What better way to awaken from your hibernation than to plan for the warming season by reading our list of Spring Festivals in Lake County? We’ve got our money on you this year to win your squad’s March Madness bracket tournament. Looking for a place to watch the games and rub it in your opponents faces when your pick advances and theirs doesn’t? Read our guide for the best places to watch the tournament in Lake County here. Trade your winter boots for a pair of galoshes and continue reading for the top things to do this weekend! There’s a party at the DoubleTree hotel in Mundelein and you’re invited. 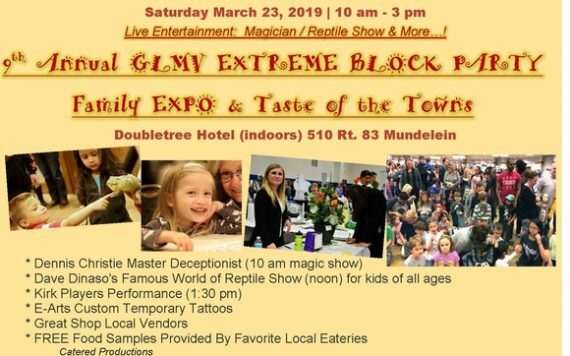 Join the Green Oaks Libertyville Mundelein Vernon Hills (GLMV) Chamber of Commerce’s annual Extreme Block Party Family Fxpo and Taste of the Towns this Saturday for an afternoon of food, fun and fraternity. Attendees will browse the goods and services from more than 100 local vendors, sample fare from nearby eateries, witness the renowned Dave Dinaso’s Famous World of Reptile Show and more. Vendors at the Mundelein event will giveaway more than 50 raffle prizes and specials throughout the course of the afternoon. Saturday, March 23; 10 a.m.-3 p.m. Free admission. DoubleTree by Hilton Hotel Libertyville-Mundelein, 510 E. Route 83, Mundelein. Bloom at the Chicago Botanic Garden for the final weekend of the beloved Orchid Show. The Glencoe exhibit, “In the Tropics,” is the only one of its kind in the Chicago area featuring over 12,000 brilliantly beautiful and unusual orchids from around the world. The show is located in the Regenstein Center. Friday-Sunday, March 22-24; 10 a.m.-4 p.m. Admission $8-$12. Chicago Botanic Garden, 1000 Lake Cook Rd., Glencoe. With its cozy, home-like features and high-quality furnishings, this Freelander Class C motorhome is perfect for that getaway trip you’ve been planning. Yearning for a vacation? Join the Lake County Fairgrounds and Event Center for the RV Outlet Show this weekend. New models including class A-C gas motorhomes, diesel pusher motorhomes, fifth wheels, travel trailers, toy haulers, fold downs, hybrids and more will line the floors of the massive 65,000 square foot facility in Grayslake. Hit the road for the Lake County Fairgrounds! Friday-Sunday, March 22-24; Fri.: 11 a.m.-8 p.m. Sat. : 10 a.m.-8 p.m. Sun. : 11 a.m.-5 p.m. Free admission. Lake County Fairgrounds and Event Center, 1060 E. Peterson Rd., Grayslake. Fly to Vernon Hills this Friday for “You’re My Superhero” at the Sullivan Community Center. Mothers, aunts, grandmothers or other significant females and their young men, ages 3-11 years old, will dress as their favorite superheroes and spend the evening dancing, playing games, listening to music and more. The “super” evening will conclude with a generous scoop of ice cream for all attendees. Visit vhparkdistrict.org for more information and to register. Friday, March 22; 6:30-8:30 p.m. Admission: $20-$25. Additional child: $10-$12.Sullivan Community Center, 635 N. Aspen Dr., Vernon Hills. “Oh, the thinks you can think when you think about Seuss!” Lincolnshire’s Marriott Theatre continues the exceptional production. Several of your favorite characters from Dr. Seuss’s feel-good stories, including Cat in the Hat, Horton the Elephant, Gertrude McFuzz and more come to life in this special hour-long performance. The cast opens the floor to conduct a Q&A session for the youngsters following the show. The March 22 show is nearly sold out. “Seussical” runs through March 31. Friday-Sunday, March 22-24; 10 a.m. Admission: $15.23. Marriott Theatre, 10 Marriott Dr., Lincolnshire.